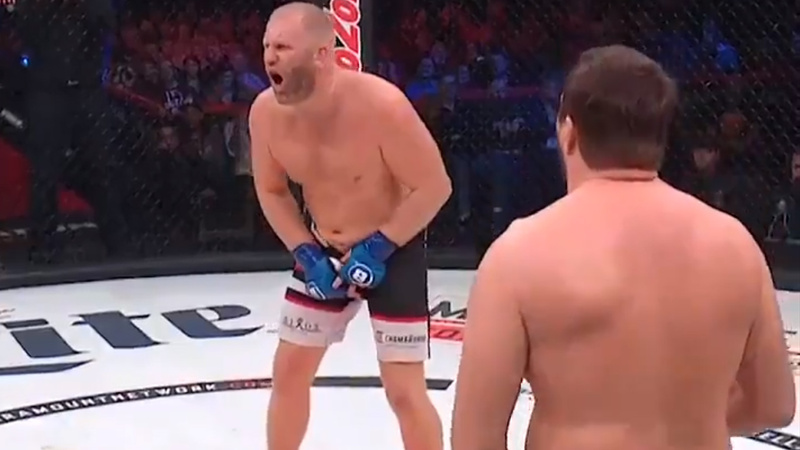 Last night’s (Fri., Feb. 15, 2019) Bellator 215 main headliner bout between heavy-hitters Matt Mitrione and Russian PRIDE fighting legend Sergei Kharitonov ends up in a no contest after “Meathead” accidentally landed a left leg kick into Kharitonov’s groin moments into the fight. Due to a low blow, Sergei slumped to the canvas moaning in agony and told doctors and referee that he was unable to continue into the contest. Sergei Kharitonov was transported to the nearby Connecticut hospital, via ESPN’s Ariel Helwani. According to Helwani’s Tweet Sergei was discharged from hospital after an initial checkup, later he re-admitted after experiencing an elevated level of pain. Doctors ran a few more tests and found that Sergei has been suffering from hemorrhoids after Mitrione’s kick. After another round of tests, the doctors determined he did not suffer from any interal bleeding. According to Bellator sources, he does have a hemorrhoid as a result of the kick and has been given topical and pain medication by doctors. He was discharged again moments ago. Mitrione since has offered his apology to Sergei for landing a hellacious kick. “I cannot begin to explain how sorry I am for everybody that paid to come to the fight to watch that fight between Sergei and I,” Mitrione said (via MMAjunkie). It would’ve been really dope – it would’ve been a great fight. Obviously, it was not intentional – the worst possible situation. We wish Sergei Kharitonov a speedy recovery.